I don’t mean any disrespect, I’m just talking narrative structure here. The Gettysburg Address is a structural masterpiece. Tyson’s exercise, while having a nice point to it, is narratively muddled. Although Neil Degrasse Tyson is a fun media icon, it’s worthwhile to point out he does not have deep narrative intuition — not like novelist Michael Crichton nor Nobel Laureate Richard Feynman. And did he really mean to say, “comprised of”? LINCOLN KNEW NARRATIVE (TYSON NOT SO MUCH). Lincoln had a Narrative Index of around 21. Neil Degrasse Tyson is more in the range of 11 (the three speeches I’ve found score 9, 11, 14). It shows when he attempts to emulate Lincoln. For three years now I’ve been holding up the Gettysburg Address as a model of the ABT structure. I examined it in detail in my book last year. I’m willing to argue with anyone who wants to disagree that the number one reason the speech retains it’s power and has stood the test of time is it’s narrative structure. Nobody has really pointed to this attribute of the Gettysburg Address so far, or if they have they’ve done it in a overly-complicated way. Ken Burns did an entire NOVA episode about the Gettysburg Address, but narrative structure wasn’t even on his radar screen. You kind of need to have some feel for ABT structure to really see it. This narrative structure, more than anything else, accounts for it’s enduring power. Joseph Campbell would be the first to agree with this. It’s about story, dude. Which means that anyone wanting to put themselves in the same company of Lincoln and his great speech really ought to attempt an equally clean and powerful ABT structure. 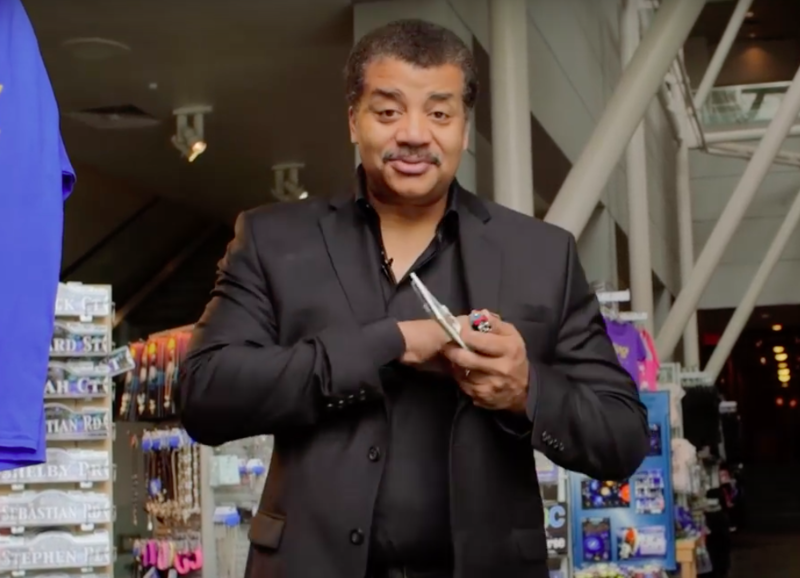 Astrophysicist Neil Degrasse Tyson, who is a great promoter of science and lots of fun, attempts exactly this with a new video. He delivers his own speech of the same length as the Gettysburg Address. He has a very nice point to it — that Lincoln also created the National Academy of Sciences which is today very important. But the way he presents his argument is muddled. His first paragraph is an ABT, sort of, using “yet” instead of “but.” But the “therefore” is disconnected in terms of logic — opening with war, then suddenly jumping to science. There’s not anything informationally wrong about Tyson’s speech, it’s just that narratively it’s a jumbled mess. The over-arching ABT structure is lacking because the “problem” is not clearly laid out. There is a “therefore” in Tyson’s last paragraph, but it’s not all that compelling. Basically he says “the time has come” rather than, “we must,” as Lincoln did. Therefore … I’m sorry to be rude, but there is a science to great communication. A major part of it is narrative structure. Without it, it’s hard to ascend to the greatest heights. Here’s the text of what Neil says in his short video. Again, there’s nothing wrong with this, it could just be more powerful with some attention to narrative structure, as I do in the next section. One and a half centuries ago, civil war divided these united states of America, yet in it’s wake we would anneal it as one nation indivisible. During the bloody year of his Gettysburg address President Lincoln charted the NAS comprised of 50 distinguished American researchers whose task was then, as now, to advice Congress and the executive branch of all the ways the frontiers of science could contribute to the health, wealth and security of it’s residents. As a young nation, just four score and seven years old, we had plucked the engineering fruits of the industrial revolution that transformed Europe, but Americans had yet to embrace the meaning of science to society. Now with more than 2000 members the National Academy encompasses dozens of fields undreamt of at the time of Lincoln’s charter. Quantum physics discovered in the 1920’s now drives nearly one third of the world’s wealth, forming the basis for our computer revolution and the creation, storage and retrieval of information. And as we continue to warm our planet, climatology may be our only hope to save us from ourselves. During the centennial of it’s charter, President Kennedy addressed the Academy, noting the range and depth of scientific achievement in this room constitutes the seabed of our nation’s future. In this, the 21st century, innovations in science and technology form the primary engines of economic growth. While most remember Honest Abe for war and peace, for slavery and freedom, the time has come to remember him for setting our nation on a course of scientifically enlightened governance, without which we all may perish from this earth. Hate to be a school marm, but this is for the benefit of everyone interested in seeing the power of the ABT approach. Here’s a rewrite of his first section, and the start of the second. I’m not attempting any flowery prose, just laying out the fact of the “argument” that ought to be made. The object is to keep the exposition singular and clean — meaning no narrative twists. The story begins with the second paragraph. America is a great and mighty nation with a complex history. Certain aspects of it’s founding were misguided and resulted in a tragic civil war. Abraham Lincoln presided over those most painful years. He was a visionary who played a fundamental role in righting those societal offenses. And here is the actual Gettysburg Address — one paragraph of exposition, one paragraph of contradiction, one paragraph of consequence. A veritable masterpiece, though not perfect as Abe was clearly conflicted in the third paragraph — torn between his feeling of impotence of a mere speech (“the world will little note, nor long remember what we say here …”) versus the enormity of what the deceased had done.